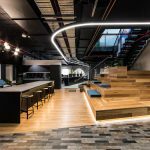 After the success of the first Flux built within the Parmelia House, spanning three floors in total, IA Design were re-engaged to deliver another two floors of Flux’s co-working environment on Levels 6 & 7. 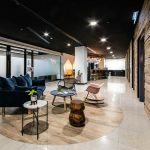 The new floors were designed to the same parameters as the previous fit out, retaining the contemporary and welcoming environment that proved a winning direction from the beginning. This innovative environment is a leading co-working space, supporting communities of innovation and creativity through a mix of co-working, resident desks, offices, events space and meeting rooms of all sizes. The two floors are complete with an interconnecting staircase built around the same look and feel as the staircase leading into the basement of Flux.